Diplomacy: the national interest or the ethical dimension? 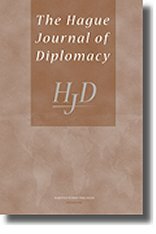 In an article in The Hague Journal of Diplomacy I discuss the two traditional rival views of the function and purposes of diplomacy: the (often competitive) pursuit of the national interest, versus the (mainly collaborative) pursuit of the greatest good for the greatest number — what the late Robin Cook, in a much misquoted phrase, called the ‘ethical dimension’ of foreign policy. Our new prime minister, Mr Cameron, has added a third candidate for the purpose of diplomacy: namely, promoting the country’s trade and investment with the outside world. Unfortunately this (hardly novel) idea was unveiled too late to be dismissed as risibly old hat in my Hague Journal article. The Journal‘s title does not refer, even obliquely, to Britain’s present Foreign & Commonwealth Secretary. Comments on the article, critical or approving, analytical or anecdotal or both, are, as always, welcome; factual corrections even more so. Please append any such comments to this blog post, not to the article itself. Brian, A fascinating read. It is always a little unsettling when diplomats and journalists find themselves on the same wavelength – on a par with gamekeepers and poachers discovering that they’ve got much in common! I agree with a lot of what you say. That the defence and promotion of Britain’s national interest should be the main aim of diplomacy/foreign policy ought surely to go without saying. It all depends, or so it seems to me, on what is meant by “national interest”. Once you have an agreed definition of that term, it is not difficult to reach agreement on the rest, many seeming differences of opinion then appearing less substantial than they did at first sight. Any worthwhile concept of Britain’s “national interest” must surely cover everything from the more narrowly selfish (e.g. getting the best financial terms in some international trade deal) to the promotion of Robin Cook’s “ethical dimension” and the robust defence and advocacy of those other good things you mention (freedom, civil rights and democracy), and (as you say) must also attempt to strike a balance between what is in our short-term and long-term interest. After all, Britain, rightly or wrongly, has an image of itself as a country that generally if not invariably acts in an ethical manner and as a historic champion – at least for its own citizens if not always for those people over whom it once ruled – of the desirable values aforementioned. It must surely follow that any foreign policy conduct that damages that self-image is against the national interest. On that basis your verbal dusting-up of the Polish foreign minister over his government’s treatment of its political opponents was unarguably in Britain’s national interest (as defined above), even if not necessarily seen to be in the national interest of all our EEC partners at the time. (I accept, of course, that there would not have been a monolithic view within the FCO about the exact language you should have used, and at least some there who thought you had overstepped the mark). I would be surprised, however, if many people would strongly disagree with the essence of my definition of the national interest. It is true that Sir Christopher M sometimes seems to to suggest that diplomacy is a Kiplingesque “great game” in which the main aim is to put one over Johnny Foreigner, but, if pressed, I think he would interpret “getting our way” as including the defence and promotion of all the things listed above, albeit tempered by a realistic acceptance of the limits to what it lies within our power to achieve. So I would doubt whether there is all that much real difference in practice between the Christopher Meyer and Oliver Miles approach to diplomacy – at most a difference of emphasis rather than substance. What slightly irritated me, and I think some others, about Robin Cook’s ”ethical dimension” was the implication (perhaps unintended) that no one else had given any thought to this before and that all previous foreign secretaries (and particularly presumably Tory ones) had not given a toss about the morality of foreign policy. Even in the days of Palmerston, when Britain’s global power was at its height, and we had the capacity “to defy world opinion” (as Douglas Hurd recently reminded us), I doubt that British foreign policy was totally devoid of moral calculation, though, as you say, the “ethical dimension” might then have been couched more in terms of “duty”. Your points about balancing the short-term against the long-term interest, and about acting in the interests of the “greatest good of the greatest number”, are admirable, but I wonder if they do not amount to a counsel of perfection unlikely to be followed very often in practice. Ambassadors – British ones at least – are after all acting under instructions from their democratically elected governments, which in turn must be mindful of public opinion, which in turn seldom favours the long-term over the short-term interest or puts the collective interest of other countries over a narrowly defined national self-interest. No doubt this is very wrong of public opinion. But that’s democracy for you (“the worst form of Government except all those other forms that have been tried from time to time” as Churchill once put it). Take, for example, Mrs Thatcher’s famously/notoriously combative campaign to secure a more equitable basis for the financing of the EEC’s Common Agricultural Policy. She was almost universally praised at the time (in the UK) for sticking to her guns, refusing to accept “half a loaf” and insisting (successfully) on clawing back the full £1 billion a year she had been demanding. How piddling that sum – enormous then – seems now by today’s standards of financial profligacy! Was it all worth it? Was the campaign won at the cost of permanently souring Britain’s relations with its EEC partners etc, etc? These are the sort of questions asked in hindsight, and were no doubt asked then by some in the FCO. But at the time I don’t think that anything but a resolute defence of selfish national interest would have enjoyed popular support (or indeed deserved to). In general, in my view, the besetting vice of British diplomacy historically has been much less an over-zealous pursuit of narrow national interest than what I would call its near opposite: the mollifying instinct – that is, the tendency to regard the maintenance of “good relations” as the be-all-and-all of diplomacy, good relations for this purpose being defined as an absence of friction or disagreement, which is or has been too often seen as a good in itself trumping all other considerations. On your other point about how far diplomats should go in cultivating the opponents of repressive regimes: diplomats are plainly under somewhat tighter rein than journalists in this area, but the questions they face are not totally dissimilar. How far should they be seen publicly to be taking sides? In my later career, in South Africa (in the 1980s), I of course made it my business to be in contact with as many members of the underground opposition as I could. I also took the view, however, that it was not part of my remit as a reporter to campaign in print against apartheid, or in favour of boycotts and the like, but simply to describe accurately how the system worked and the effect it had on the lives of people. My readers, I reasoned, did not need to be told by me that apartheid was a bad and evil thing. They would be able to draw that conclusion for themselves from a mere description of the facts. That, I think, was regarded by the then emerging breed of “advocacy” journalists as a rather fuddy-duddy approach, based on an artificial notion of reportorial detachment. Perhaps they were right. Certainly, 20 years earlier, as a young man covering the Soviet suppression of the short-lived “Prague Spring” , I gave much freer rein in what I wrote to my natural emotional sympathy for the cause of Mr Dubcek and his friends. The replacement Soviet puppet regime of Mr Husak probably had, by its lights, good grounds for eventually giving me my marching orders. (I wasn’t, I must in honesty confess, wholly unmindful of the fact that expulsion by a repressive regime seldom harms a journalists’s career!) Which was the better journalistic policy? I’m not sure. Perhaps it just goes to show that as one gets older one becomes a slightly colder fish. Brian writes: Many thanks for this very stimulating comment, Michael. You have raised a number of challenging points, to which I will respond in a new comment, coming soon. This is my promised response to some of the challenging points in your comment above (here). I would argue — as indeed I do in my Hague Journal article — that the difference in practical terms between the two conflicting philosophies — in somewhat simplified terms, the hawkish tendency’s attribution of primacy for the national interest on the one hand, and the doveish focus on trying to make the world a better place on the other — can’t be wished away, as you seek to do, by defining the national interest so broadly as to encompass ‘making the world a better place’ as well as the pursuit of more short-term material interests. Even if it’s granted that fostering democracy and respect for human rights in foreign countries is in some rather vague sense in Britain’s long-term interest, it seems to me clear that this was not the dominant motivation for (e.g.) giving as much moral support as we could get away with for anti-communist dissidents and democrats in the Soviet Union, Poland, Czechoslovakia, and elsewhere during the cold war. To take another example: for many years Britain, like most other donors of development aid to poor countries, tied a high proportion of our aid to procurement in Britain of the goods and services provided. For years I was in a very small minority in the Diplomatic Service in pointing out that the value of our aid to the recipient country was significantly reduced by preventing the recipient from getting maximum value for money in the most competitive markets, even if this meant using UK aid money to buy, for example, vehicles in Japan or technical services in Germany — even if the Japanese and Germans tied their own aid to procurement in their own countries. My argument for untying all UK aid was regarded as absolutely incomprehensible to many of my FCO colleagues, and indeed to Conservative ministers, for whom it was self-evident that the British tax-payer’s money should be used in a way that would bring maximum benefit to the UK economy, and not to our competitors. Yet now, many years later, none of our aid is tied, and internationally accepted aid doctrine recognises that tying aid is retrograde and damaging (even though several countries continue to practise it, out of deference to chauvinistic domestic opinion and to domestic commercial interests). The change has come about through a change of emphasis from the national interest in getting benefit for local commercial interests out of overseas aid to a recognition that the reduction of world poverty benefits more from untied aid than from national tying. The dominant motive here is the straightforward desire — even obligation — to help to make the world a better place by reducing global poverty, not the pursuit of a long-term British interest in living in a world where more people are more prosperous and therefore better able to buy our exports. The difference between the national interest hawks and the ‘better world’ doves has identifiable consequences in the real world, too. The example quoted in my HJD article of differing attitudes within Whitehall to proposals for British development aid to a hydro-electric dam project in an African country, where the project would create or save hundreds of jobs in Britain and improve relations with the African country concerned but where the project is economically and socially unsound, is fictitious, but based on real-life experiences of the same underlying dilemma. To the traditional, old-scho0ol foreign office hawk, it’s a no-brainer: if support for the project helps to create jobs for British workers, and the African government wants it, why argue? To the more internationalist dove, it’s little short of criminal to spend money from a limited aid pot on a project that will produce very little benefit for the poor in a poor country, when the same money could be spent on other purposes which would save lives and improve the quality of life of others. Of course it’s just about possible to re-define the conflict as one between the short- and long-term British national interest, but to do so significantly distorts the nature of the conflict, and may also tend to distort judgement about the right way to resolve it. There’s an instructive parallel in individual private behaviour. When someone behaves altruistically — giving blood, risking her life going to the aid of a complete stranger being beaten up by thugs in the street, even just giving money to charity — it’s always possible to interpret the act as fundamentally selfish (it makes the altruist feel better about herself, impresses her friends and evokes admiration, encourages others to be generous to her in return): but to interpret altruism as selfishness is seriously misleading, even if it contains a grain of truth: it demeans what should be admired and respected, and involves a bad misjudgement of personal motivation. I agree that “Britain, rightly or wrongly, has an image of itself as a country that generally if not invariably acts in an ethical manner and as a historic champion – at least for its own citizens if not always for those people over whom it once ruled – of the desirable values [of democracy, civil rights, etc. ]”, but I’m not sure that this is the image of Britain universally perceived in the outside world. It’s probably impossible for a country like Britain which has been, and largely remains, actively involved in the affairs of countries in every continent of the world to avoid trampling from time to time on the sensitivities and interests of an awful lot of foreigners. Our colonial record actually includes many acts and policies of genuine altruism and generosity, but these are now overwhelmed by the perception, even at home, of colonialism and empire as having been brutally imposed for the exclusive benefit of the imperial power. However over-simplified that perception might be, it imposes on us — and on the many other former colonial powers — an absolute obligation to behave now in an unreservedly generous and altruistic spirit in our approach to such global problems as sickening levels of poverty, climate change and the destruction of the world’s environment, religiously-inspired terrorism, and the denial to millions of people of their fundamental human rights. To assert that we should behave in this way mainly because it’s in our national interest to do so (even though of course it is) is to cheapen the perception of our real and fundamentally decent motivation. It was not, AFAIK, elements in the Foreign Office who thought I had over-stepped the mark in using robust language when delivering the EEC démarche to the Polish foreign minister, but rather some of the other EEC ambassadors in Warsaw, who thought it more important to maintain amicable relations with their contacts in the Polish foreign ministry than to give moral support to Solidarity and thus irritate the Polish communist régime. You correctly observe that ambassadors act on instructions from their governments, but I try to point out in my HJD article that most diplomatic activity is conducted without explicit instructions from ministers, and indeed a high proportion without instructions at all. Of course ministers, if they’re any good, lay down broad policy guidelines which their diplomats (not only ambassadors) are required to observe in their dealings both with foreign governments and with other diplomats. But within those guidelines there’s generally plenty of room for personal initiative and the exercise of personal judgement. Moreover, policy-making is not a one-way street. An effective diplomat takes pride in usually writing his own instructions — i.e. he recommends to his government the policy he thinks should be adopted on a particular issue and suggests how he should be instructed to act in pursuit of it. Nine times out of ten the reply — generally from another diplomat in the diplomat’s capital, not a minister — will say simply: “I agree. Please act accordingly.” Of course on major issues of foreign policy instructions will almost always be approved by a minister. But these are rare, and even in such cases ministers will always have received advice from their diplomats both overseas and in their own department, and it’s a relatively brave minister who makes a practice of overruling the advice of her officials, especially if she is not familiar with the complexities of the issues at stake. Diplomats are not just the executors of policies made and transmitted by ministers: they are active participants in the diplomatic, foreign policy-making process. Finally, I enjoyed your comparison of the relationship between journalists and diplomats with that between poachers and game-keepers — shedding an interesting light on your own experience as a foreign correspondent overseas and your relations with the relevant British embassies and high commissions. I was an embassy press attaché for a few years and found that my relations with the local British, American and other western journalists was more symbiotic than competitive or adversarial. I took not very calculated risks in sharing information with them, generally on an unattribtable basis, and received a good deal of invaluable information from them in return. I continued this risky but productive practice, on the whole, later in my career as an ambassador and high commissioner, and almost never came to regret it. As to whether journalists ought to be neutral observers and factual reporters, or active campaigners against injustice, I’m inclined to agree that the fashion has swung too far in the direction of campaigning. This may be because most of us get our factual news these days from radio and television, and look to our newspapers and periodicals for comment, assessment and value judgements. I’m not sure whether this has been a desirable development, but anyway I suspect that it’s here to stay.